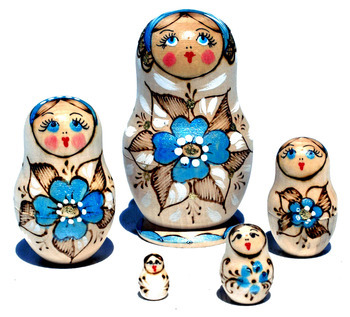 Handmade Russian wooden nesting dolls matryoshka with images of sky blue flowers, pirography or fire burning art, set of 5 pieces. Height of largest doll is 10 cm. Shipping: by certified post, EMS. Other shipping agent possible by agreement. We ship orders worldwide from Moscow, Russia. Delivery time depends on the country and usually takes 2-5 weeks.